For anyone who has used a feature phone or smartphone in the last decade, Opera Mini is probably a familiar name. Opera Mini has been available for almost every feature and smartphone platform and has offered a simplified browsing experience to millions of users since it was first released. 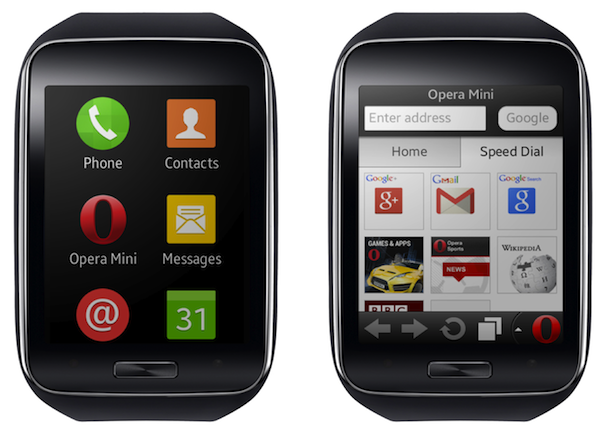 Today Opera made another big step by announcing that Opera Mini will soon be available for use on the Samsung Gear S.
As you expect the Opera Mini will allow you to browse the internet on your wrists and has the familiar features – mobile compression that shrinks pages to as little as 10% of their original size and speed dial with your recent pages. The Opera Mini browser for the Samsung Gear S also has a Smart Page that aggregates social updates and news on one screen. You can change between Smart Page and Speed dial with a tap of the finger. It’s also notable that this version of Opera Mini will be running on Tizen, and will also come with features like private browsing. Opera Mini will be available from the Samsung Apps store once the Gear S goes on sale this fall. If you are missing anything here then I have to fill you in. Samsung Gear S is different from others before smartwatches as it's also a full-featured 3G and Wi-Fi-enabled device: it can make calls, receive calls, check messages and be connected to GPS even without a phone nearby.